Official announcement from the fine folks over at Enterplay, the MLP:CCG will be officially released December 13th. Full details below. 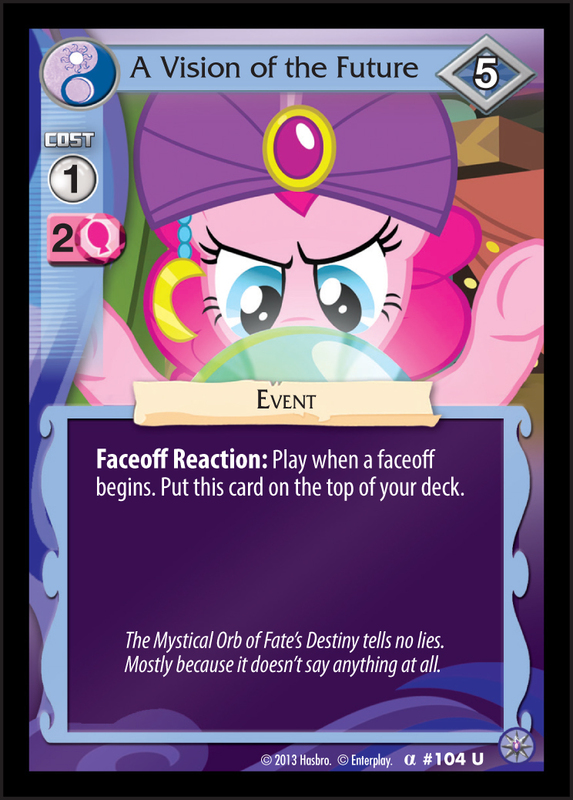 MLP:CCG Street Date: December 13! My Little Pony Collectible Card Game now has an official street date of December 13. Theme Decks and Boosters will all launch on this date. 2-Player Starter Sets will be available shortly thereafter. There will be a limited number of Premiere events the weekend of December 7, as well as other launch events at retailers nationwide. More to come on this in the very near future. A: A Mane Character card (for example, your favorite pony from the Mane Six), a 45-card draw deck, a 10-card Problem deck, plus a handful of markers to use as action tokens. Q: How do I get my Mane Character? A: Four of the Mane Characters are included in Theme Decks: Rainbow Dash & Rarity in one, and Twilight Sparkle & Applejack in the other. Theme Decks are the most common entry point into the game and include a rulebook, punch-out action tokens, and 59 cards (10 Problem, 45 Draw Deck, 2 Reference Cards and 2 Mane Characters). The 2-Player Starter Set is another way to get started, featuring the Pinkie Pie and Fluttershy Mane Character cards. Q: How many cards are in the first set? A: There are over 250 cards in the first set. Around a dozen cards are exclusive to the deck products, including the six Mane Character cards. There are six types of cards in the game: Friends, Mane Characters, Events, Resources, Troublemakers, and Problems. A: MLP:CCG will be broadly available at your favorite trading card and hobby stores as well as major retailers! Q: Will there be Organized Play tournaments? A: Yes! We are starting with a “learn to play” approach in December and then will launch tournaments some time in January.